We’d love your help. 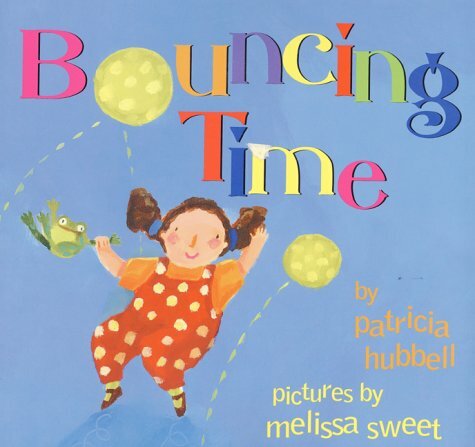 Let us know what’s wrong with this preview of Bouncing Time by Patricia Hubbell. A lively, loving book to share.Join in this rhyming, rollicking romp to the zoo and watch animals jump, tumble, and flip with bountiful, bounciful energy. Vibrant images convey the joy of a wonderful day that ends with time to bounce into bed and dream. To ask other readers questions about Bouncing Time, please sign up. A rhyming book that provides the opportunity for a lot of movement. I like to use it the same way I use songs and finger-plays during my story times: to give the children a break and have them moving for a few minutes. Hubbell, Patricia. (2000). Bouncing Time. Singapore, Asia: Harper Collins. Annotation: For babies to preschool. Melissa Sweet’s illustrations are bright, fun, and the softness of the characters is very appealing to young children. Additionally, Sweet skillfully uses lines to illustrate motion in the pictures, the reader can see the characters and animals bouncing; the lines also guide the reader to the next page. In this story, a mother asks her baby, “How will you bounce today, baby?” As the sto Hubbell, Patricia. (2000). Bouncing Time. Singapore, Asia: Harper Collins. Annotation: For babies to preschool. Melissa Sweet’s illustrations are bright, fun, and the softness of the characters is very appealing to young children. Additionally, Sweet skillfully uses lines to illustrate motion in the pictures, the reader can see the characters and animals bouncing; the lines also guide the reader to the next page. In this story, a mother asks her baby, “How will you bounce today, baby?” As the story progresses, the mother asks if she will bounce like a clown, puppy, grasshopper, and many other things. The mother and baby go to the zoo and the animals are bouncing there too. 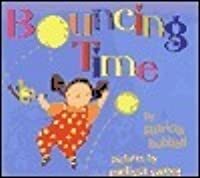 Patricia Hubbell places emphasis on the word bounce throughout the book by using a different font, size, and color than the rest of the written text. This makes reading the word more exciting for younger words. Personal Reflection: I like this book because it can be used to engage younger children. Toddlers and preschoolers will enjoy bouncing like the characters and animals in the story. In addition, this book would be nice to read before taking a trip to the zoo. This is a fun and colorful rhyming story. I think I will be using it to incorporate as a bounce in my Baby Rhyme Time storytime, although I'll most likely be skipping a few pages. The text is rhythmic and fun but I do think the last line should rhyme with the page before it and say "sweet dreams" but that is just my personal opinion. Overall it was a cute little book. This book has bright colors and illustrations that match the story. The wording is simple and there is not too many words on each page. I would say that first and second grade would be able to start reading this on their own. There is also some rhyming throughout the book that will help children guess what is coming next. It was not quite what I was thinking of for a PJ storytime (except for the very end), but it might work for a toddler storytime. Especially if the parents get in to it with their children. Would be a fun lap-read if you bounce the child(ren) as you read. with all of the animals shown in this title, it's a wonder that all description used is limited to bouncing. sure, grasshoppers and frogs bounce but to show other animals and not provide additional movements--well, i don't get it. Another rhyming book with cute animals and a story of interactions between mom and daughter. She sees different animals at the zoo who are bouncing like she is. She ends the story with tucking her into bed and reminiscing on the things she has seen that day. An exuberant infant bounces through the day's activities, including a trip to the zoo. Great for toddlers to learn animals and pretend to be different ones. Kind of texty for a baby book, but lots of reference to bouncing (obviously) and taking baby out to enjoy the world. I'm pretty sure this book is lies, technically. But it's sweet. But wordy. An easy, simple read for younger toddlers. Offers a good intro to animals with short rhymes. Patricia Hubbell has been writing poetry since she was eleven years old. In 1998, her Wrapping Paper Romp was selected as a Parents Magazine Book of the Year. Patricia Hubbell lives with her husband, Harold Hornstein, in Easton, Connecticut, the small town where she was born. Remembering how much their children and grandchildren loved to bounce when they were very young prompted her to write Bounc Patricia Hubbell has been writing poetry since she was eleven years old.